Once in a while I get so enamored with a particular plant/flower that I want to stare at it, take photos daily, talk about it and share it with anyone who will listen. 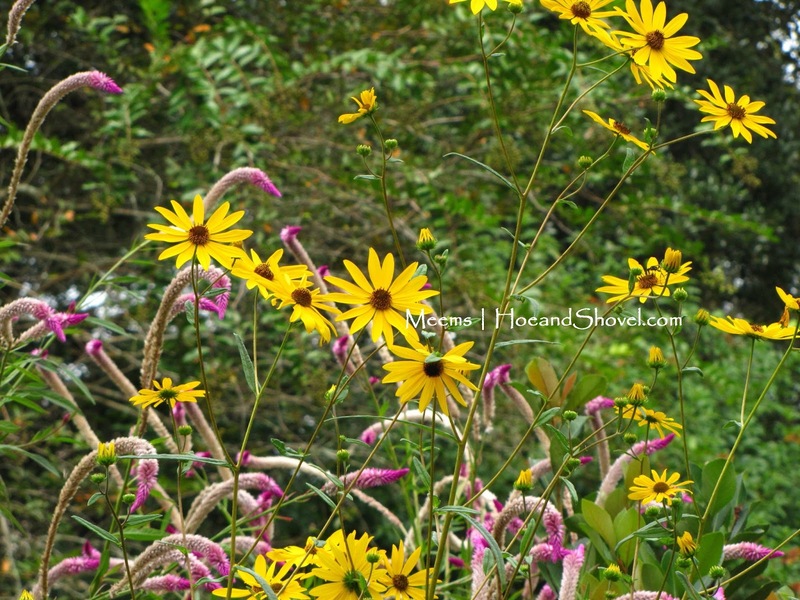 Swamp Sunflower. Yes. Here we go. 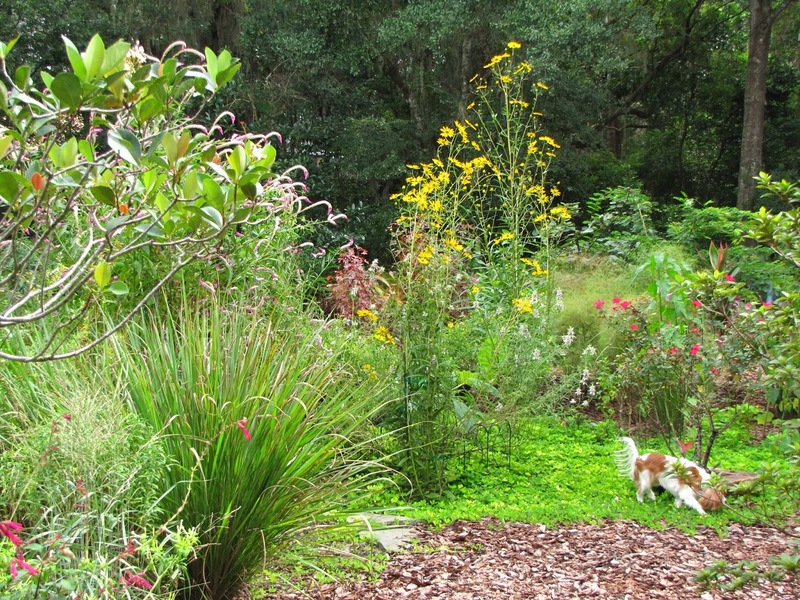 My friend and fellow Hillsborough County Master Gardener, Nanette, over at Bay-Friendly Landscaping heard that I was trying to create my new sunny garden without spending any money. One day when we were volunteering together she showed up with 4 baby swamp sunflower plants and a couple of scorpion tail plants. I planted them all in June. 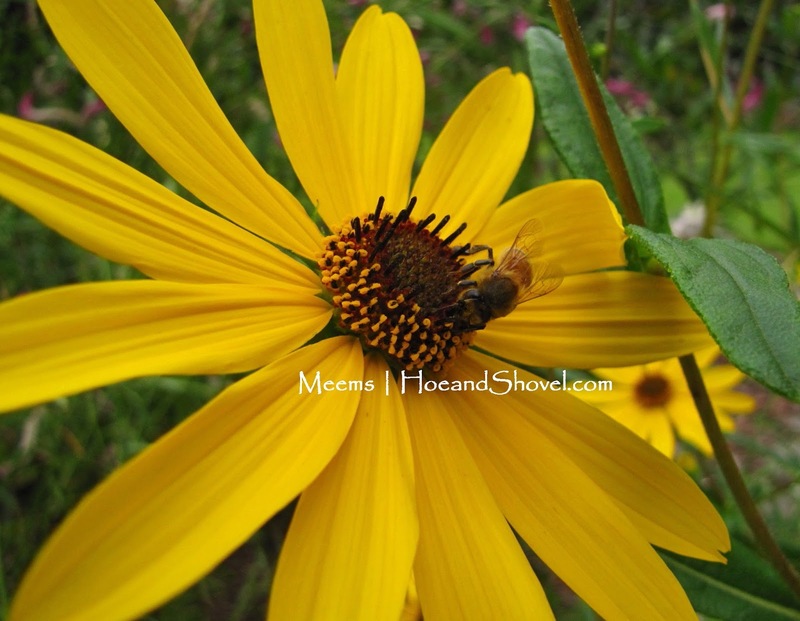 I gave my baby swamp sunflower (Helianthus angustifolius) plants the sunniest possible conditions because that's what they like. Wow. Did they ever grow fast and they grew tall! They were every bit of 9' (probably taller) in height by September with tiny tight buds from top to bottom. Even those were cute. I'm not kidding. 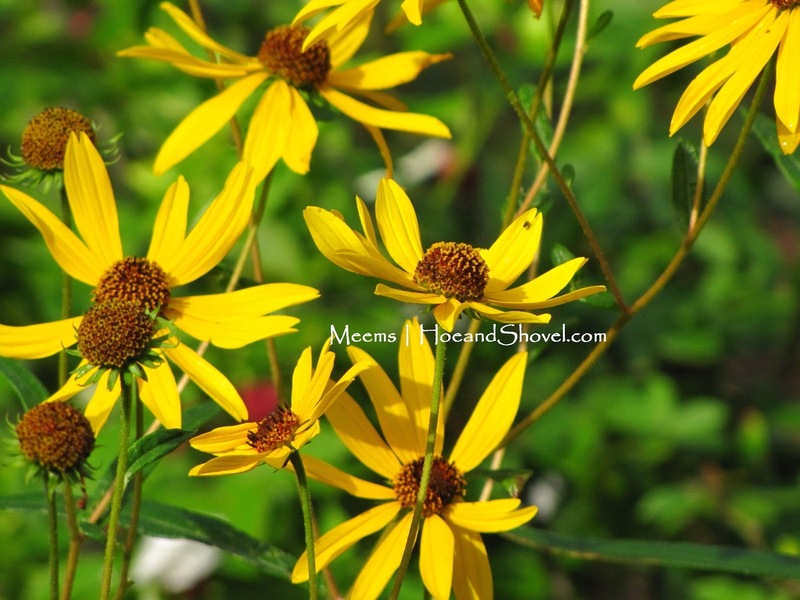 If you live in Florida, you have probably seen these sunny yellow wildflowers along the roadside this month. They don't grow as tall there, but they are full of bright yellow faces and brown buttons in the middle. I have seen some gorgeous groupings of them on my trips over to the center of the state. We also saw them along country roads on a recent trip to North Florida. They are so bright and cheery, you can't miss them. Each flower is about 3" across. They will catch your attention even if you aren't looking for them. 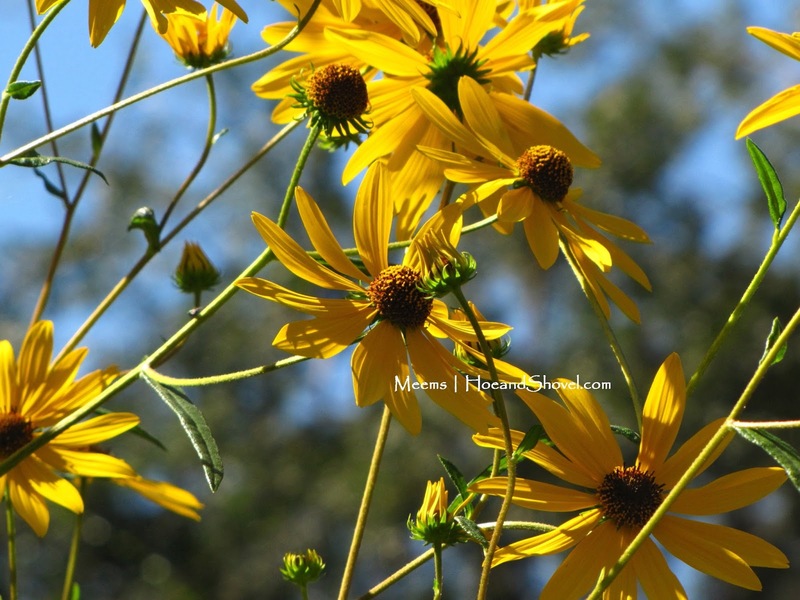 Give me blue skies and swamp sunflowers any day and I'll be just as cheery as their happy faces. It's the simple things y'all! This is the back side of my sunniest bed. Only the perennial peanut ground cover was planted here when we moved in. I'm letting that spread as it wants to. 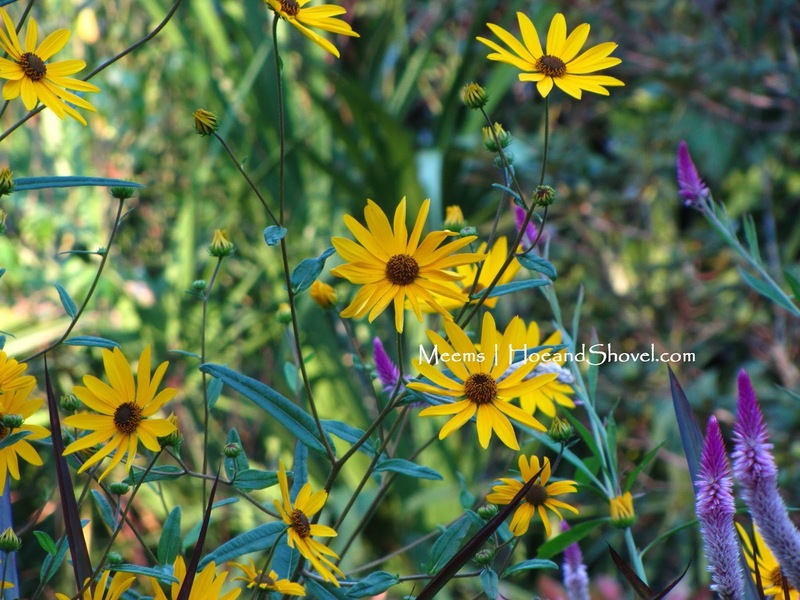 Placed in the middle of my sunniest flower bed seems to be a good place for swamp sunflower. They are so tall I can see them as I round the corner from the central pathway. I staked the center stalks with rebar before they bloomed. I suspected they might get top heavy. I think that was wise because some of the side shoots drooped and snapped during that week of constant rain we had in late September. I'm going to give them a hard prune next June to try to keep each bush a little more compact, but that's not to say I mind the height they are at all. Just thinking I might not need to stake them if they are bushier. The purple flowers you see are Celosia spicata. Don't they make a nice pairing. Native bee balm (Monarda punctata) is blooming pale pink flowers right next to both of them. There are so many pollinators buzzing around this area that you can hear their music. 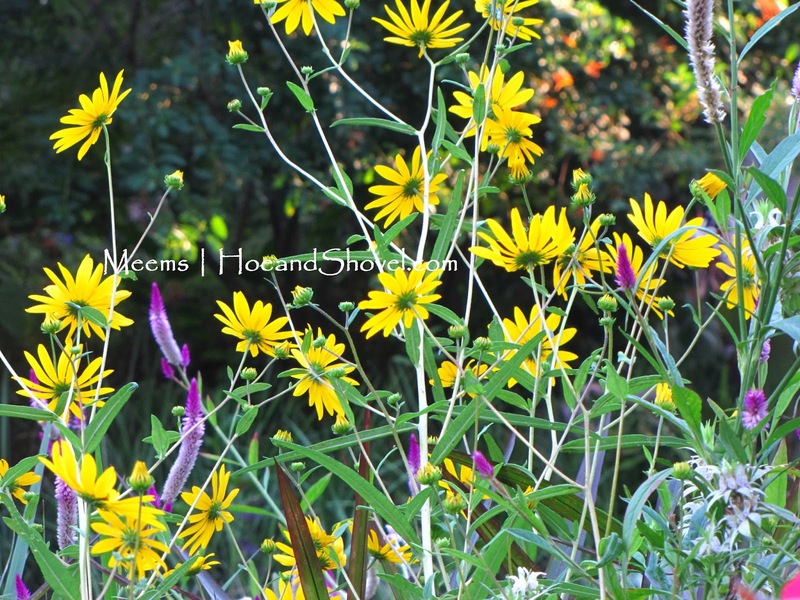 My only wish is that swamp sunflower would last through spring. 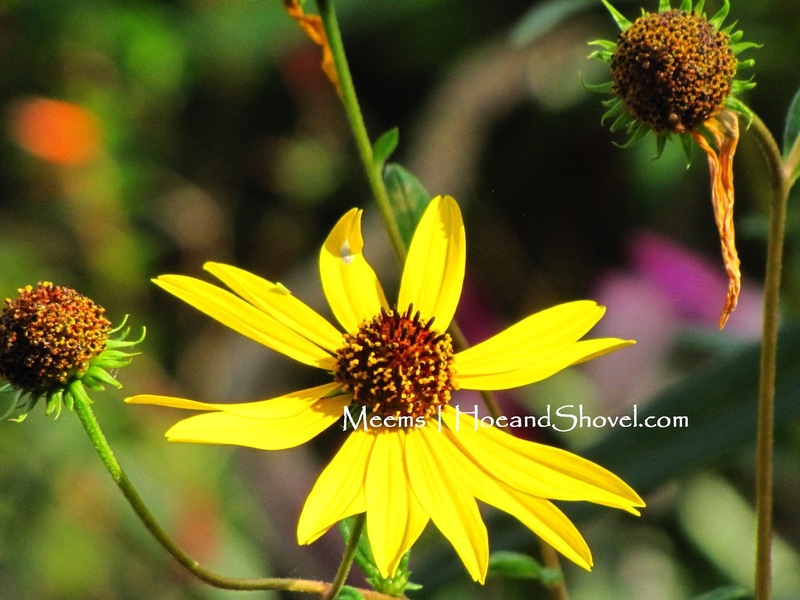 Alas, they are a fall flowering native plant to Florida. I've been told they will self-seed. Oh, what a glorious thought. 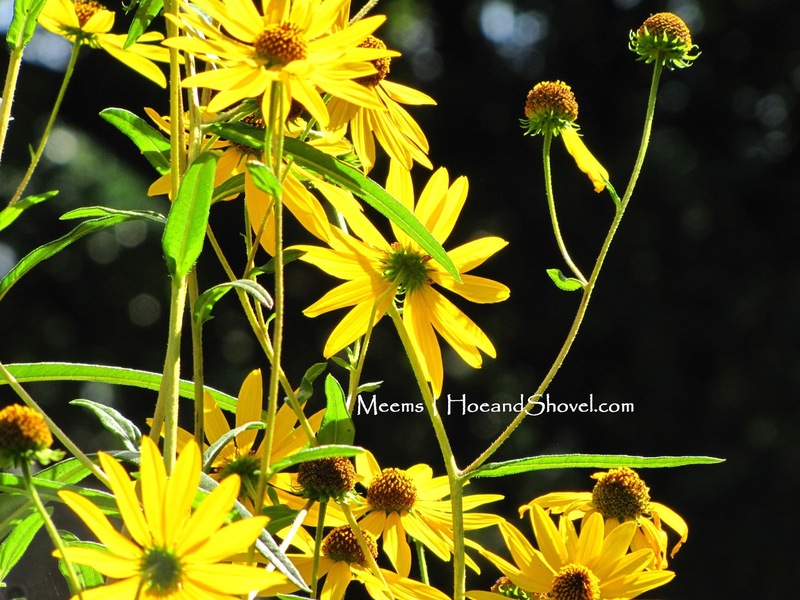 More swamp sunflowers next year. Oh my. I hope you're enjoying this excellent fall weather Central Florida is having this week. Pretty perfect for outdoor activities. I too have a prolific spot of Swamp Sunflowers that I planted last year for my daughter's wedding. Just to warn you, they will double/triple by next year... they really multiply. I love them, but they are a great passalong plant! Those are wonderful, happy flowers and I love them with the Celosia spicata. Is there a place to buy seeds of both of these? You keep inspiring me with your gardens. I'm over on the east coast, zone 10. I'd be happy to send you some seeds Lorraine. Can those grow in zone 9? Lovely sunny happy flowers ! As we move towards winter here in the uk, the sight of flowers is becoming more precious every day! So my swamp flowers are done for this season, I only wish they would last until thanksgiving, but they bloom early October and done before Halloween. They do come back, but I want to plant some of the heads (where the seeds are) in little pots to give away next year. Is that the way to do it? Snipping the heads and just planting them in pots? I think you should let the flower heads dry. Remove the seeds and then plant in pots.